Heat 2 tablespoons of the olive oil in a 10-or 12-inch heavy ovenproof skillet over medium-low heat. Add the fennel and sauté for 8 to 10 minutes, until the fennel is tender. Add the garlic and cook for 1 minute. Add the wine and bring to a boil, scraping up any browned bits. Cook for 2 to 3 minutes, until the liquid is reduced by half. Add the tomatoes with the liquid, tomato paste, oregano, salt, and pepper to the skillet. Simmer over medium-low heat, stirring occasionally, for 10 to 15 minutes. 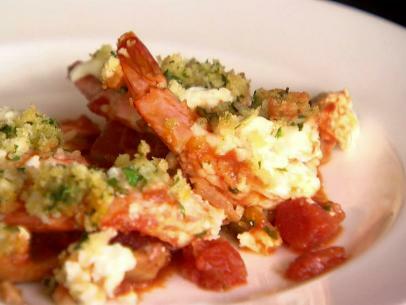 Arrange the shrimp, tails up, in one layer over the tomato-mixture in the skillet. Scatter the feta evenly over the shrimp. In a small bowl, combine the bread crumbs, parsley, and lemon zest with the remaining 2 tablespoons of olive oil and sprinkle over the shrimp. Bake for 15 minutes, until the shrimp are cooked and the bread crumbs are golden brown. Squeeze the juice of 1 lemon over the shrimp. Serve hot.